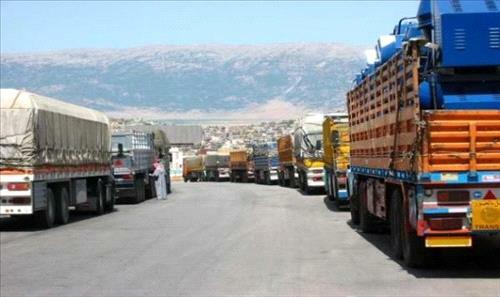 AMMONNEWS - The volume of Jordanian exports to Syria plummeted by 70 percent in the first three months of 2019 despite the reopening of land border crossings between the two countries, President of the Jordan Chamber of Industry Fathi al-Jaghbeer said on Monday. He told the Jordan News Agency (Petra) in an interview that the value of Jordanian exports to Syria in the first quarter of the current year amounted to only JOD19 million compared with JOD61 million in the same period of 2018. Al-Jaghbeer blamed "restrictions and impediments" placed by Syrian authorities for the decline, explaining that Syrian importers are required by the country's authorities to obtain a license allowing them to import certain Jordanian products at fixed quantities and types. Al-Jaghbeer, who is also President of the Amman Chamber of Industry, demanded the government pursue trade reciprocity with Syria, which hinders the outflow of Jordanian commodities and products to its markets. He described the Syrian restrictions "unreasonable" and contrary to the way Jordan allows Syrian exports to access its markets. He urged the government to restrict and control the inflow of imports from Syria or any other country that hinders the entry of Jordanian exports, stressing that such move is "urgently" needed to protect national producers and economy.